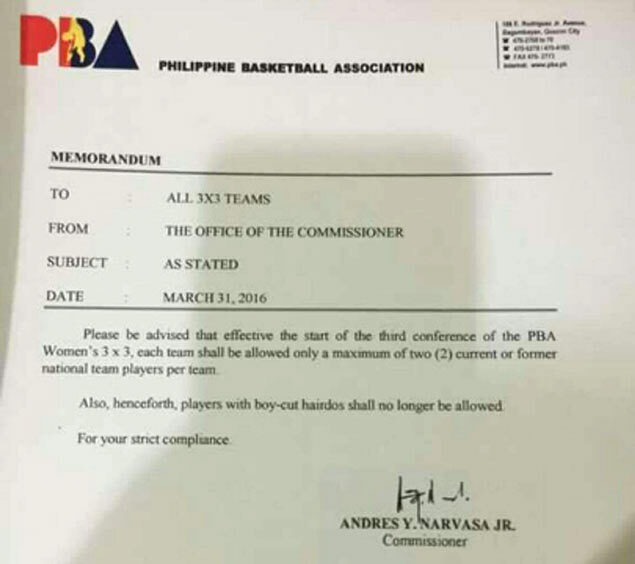 Here's a copy of the memo released by the PBA and signed by Commissioner Chito Narvasa. THE PBA has once again come under fire after releasing a memorandum banning 'boy-cut' hairdos from a women's 3x3 basketball tournament that it is staging to coincide with the pro league's games. SPIN.ph was able to secure a copy of the memorandum signed by no less than Commissioner Chito Narvasa mandating the next batch of PBA women’s 3x3 participants to refrain from sporting short hair or 'boy-cut' hairdos. “Henceforth, players with boy-cut hairdos are no longer allowed. For your strict compliance,” wrote Narvasa in the memo released to the participating teams. The memo dated March 31 confirmed an earlier report by website tiebreakertimes.com about the complaint of some cagebelles who found Narvasa’s order discriminatory. A copy of the memo first appeared in a Viber chat featuring some of the players seeing action in the league. Even PBA legend Ramon Fernandez was left flabbergasted when he was shown a copy of the memo by SPIN.ph, venting his emotions in a Facebook post while tagging a known Cebuano LGBT supporter and sports patron. “Isn’t this rule some form of discrimination?” said Fernandez. Meanwhile, another SPIN.ph source bared the story which Tiebreakertimes ran a few weeks ago so riled Narvasa, who, according to sources, threatened to cancel the accreditation of the websites’ staff for next season. “Ang pagkakalam ko, wala na kaming accreditation for next season. Wag mo na lang ilabas pangalan ko if ever na isulat mo ito. Isa sa editors namin ang nagsabi na wala na kaming accreditation for next season,” said a staffer. Efforts by other SPIN.ph staffers to get the side of the PBA have so far proved futile.